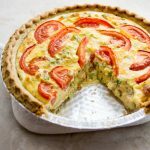 A delicious and easy quiche with crunchy bacon bits, tender broccoli, and roasted tomato slices. Bake the pastry shell for 7 minutes at 350 F. Prick the shell a couple of times with a fork before baking. You can bake the frozen shell — no need to thaw. Microwave the bacon strips according to package instructions, about 5 minutes. I microwaved the bacon with paper towels to help soak up the grease. Also microwave the broccoli until tender, about a few minutes. Drain with a paper towel. You want to make sure the broccoli is dry before you put it in the quiche otherwise your quiche will be watery. Scatter a third of the pepper jack and cheddar cheese mix to the pastry shell. Add broccoli over the pie. Add another third of the pepper jack and cheddar cheese mix over the pie. Crumble the bacon and spread over the pie. Scatter scallions over the pie. Add the remainder of the pepper jack and cheddar cheese mix over the pie. Beat eggs, milk, basil, and pepper together. Pour over pie. Bake the pie at 350 F for 50 minutes or until it starts to brown. Let cool for 20 minutes before cutting into it.